I'm very proud to be a part of Tympani Marketing and its 35-year affiliation with American Express. The challenge: American Express, one of the world's top 25 most recognized brands, turned to us to bring its Travel Insiders and Travel Services Locator up to date. In addition to designing and building the website to be responsive, American Express is also refreshing its branding — the first major overhaul of brand standards since 2011. The Travel Insiders program offers high-end travelers the ability to connect with a destination expert — we're not talking about a tourist getting a tip on a good restaurant. These are folks who will spend big bucks to have a once-in-a-lifetime adventure. The pressure was on to deliver a site that could make that special connection happen. The site includes a home page, explaining the program along with a carousel showcasing Travel Insiders pulled randomly from the data base. When desired, the User may search for a Travel Insider by Destination, Special Interest or type of Cruise. 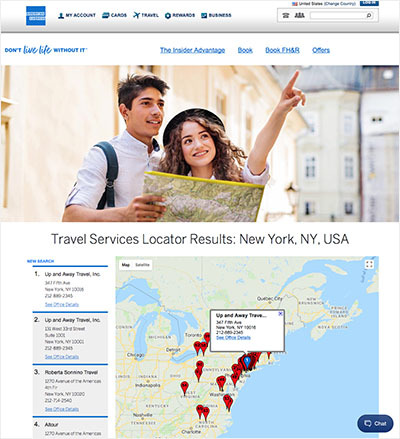 The Travel Services Locator allows Users to find American Express Travel offices by location. 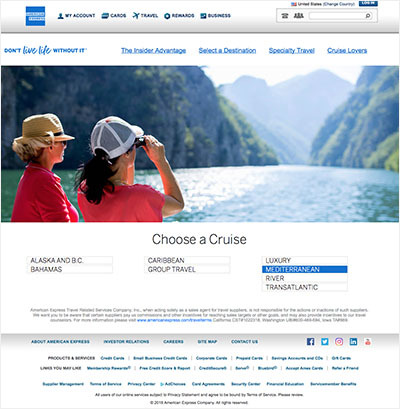 Selecting to search by Destination, Special Interest or Cruise, produces a page with criteria available within the Travel Insider program. Selecting from the available criteria results in a scrolling list of Travel Insiders from which to select, complete with contact and biographical information for each. Entering a geographic location, "New York" for example, produces results in as broad or narrow an area as the request submitted. From the list of results, the User may select individual offices to view details, such as office hours, specialties and links to email and website.